On the short bus ride from Skopje to Ohrid, I came to realize how much I love traveling Macedonia. It’s safe to say that the Balkans are my favorite area to travel through in Europe. With the friendly people, affordable prices, and amazing coffee we almost had to be ripped away from Serbia. After spending a month in Belgrade and Niš, we knew that it was time to move onwards to Macedonia to see the Church of St. John at Kaneo and more. We arrived in the capital of Skopje and had a unique time delving into this compelling city. All we heard from the locals in Skopje, was that we just had to go to Ohrid, Macedonia. I’ve seen plenty of lakes in my day. Heck, I even grew up on one. So what was the big deal about this Lake Ohrid? Riding on the minibus from Skopje to Ohrid, I still couldn’t quite gather why everyone in the Balkans had a crush on lady Ohrid herself. But boy was I in for a surprise when we finally got to this Macedonian Gem in early April. We love that we can get shots like these with our GoPro! After spending four months in the Balkans, I have come to realize that transportation is not as simple here as in the rest of Europe. Trains are generally less efficient, and bus travel can take a very long time. We arrived at the bus station in Skopje with little information on the travel times to Ohrid. Thankfully, minibusses from Skopje to Ohrid run quite frequently. The 170 km journey takes about 3 hours and costs a little over 450 MKD (€8). The first time I saw Lake Ohrid I was amazed at its beauty. The second time I saw it I was still amazed, and the amazement never stopped for the remainder of our stay in Ohrid. I now get why the everyone made such a big deal about this place, I mean this lake was stunning. The water is crystal clear with a deep blue coloring, and every day it looked like glass. What was even better was the weather we had in April – blue skies and sunny every darn day! Visiting Ohrid at this time could not have been more perfect. Prices were low, the weather was amazing, and I think we were two of the ten tourists in town. What to do in Ohrid? The first thing we did was run straight to the water and breathe in the fresh air while being surrounded by complete bliss. After staring into the distance for about 5 hours, we decided we better get doing something active! Ohrid is a large town with the typical large pedestrian street. Here on Bulevar Makedonski Prosvetiteli, there are the typical souvenir shops, ice cream stands, and many of the favorite franchise stores. The boulevard is clean and enjoyable to walk through. At the end of the boulevard, there is a large harbor with local fisherman offering to take passerby around the lake at an agreeable price for €5 in the off-season. Ohrid is home to 365 churches; however, the Church of St. John at Kaneo was our favorite and most impressive. The Church is located on the edge of Ohrid, right past all the waterfront restaurants and bars. It is conveniently placed on the edge of a cliff and is the best view of Lake Ohrid and the surrounding mountains. In the summertime, there are spots along this cliff for diving, but I think we would have been considered crazy if we jumped in this freezing water in April. Church of Sveti Jovan at Kaneo, brought to you by our favorite travel accessory: Our GoPro! After spending over a year traveling Europe, I tend to get “churched out” very fast. For those like me, I found it quite enjoyable to climb to Samuel’s fortress. I was previously unaware that Ohrid is one of the oldest known civilizations in Europe, and the lake is over 3 million years old! This fortress was built in the 10th century but is actually thought to be built over fortifications from 350 BCE. 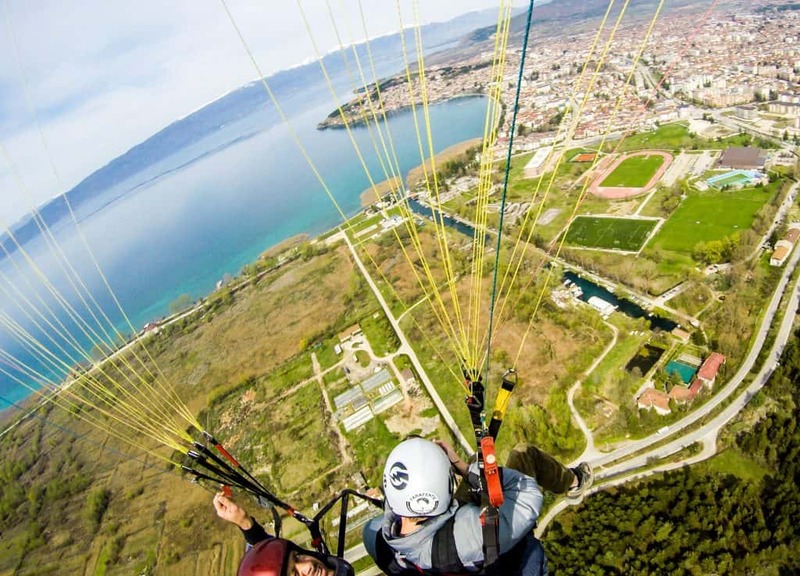 This makes Ohrid not only a UNESCO’s World Heritage Natural site, but a Cultural one as well. 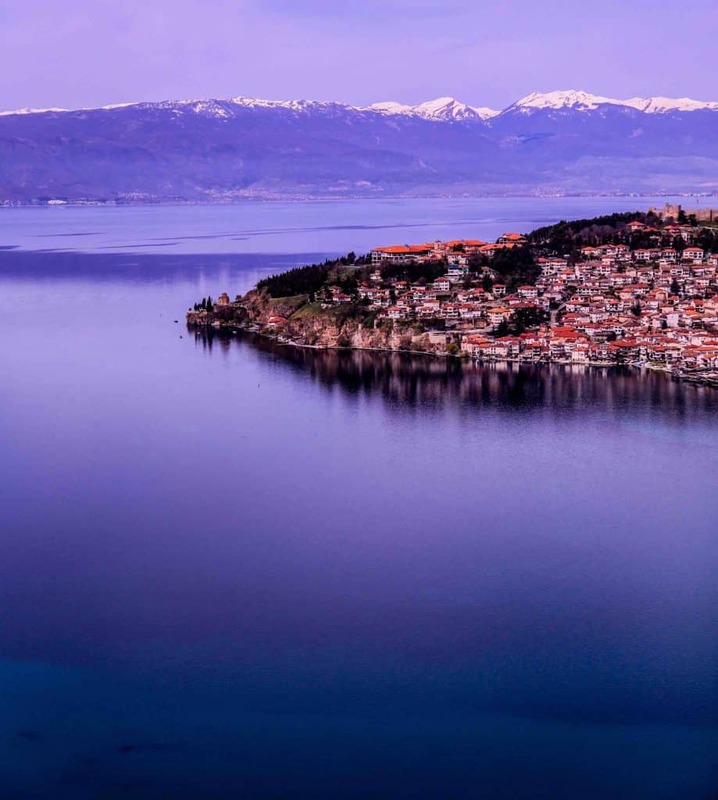 Ohrid is home to a number of great hiking trails with astonishing views. Many of these trails are in Galichica National Park, which has an entrance just at the south end of Ohrid. Paragliding had always been high on my list, but my one stipulation was that I had to fly high somewhere incredibly beautiful. Ladies and gentleman, I am pleased to say that I finally found that place. Ohrid was the perfect place for us to sail into the sky and feel like the birds that are lucky enough to fly over Lake Ohrid. After we were suited up with our harness and the glider was completely spread out and unfolded, it was take off time. I was first and was completely unaware that the running start required for takeoff was so difficult. I was told to run and not to stop running until we are in the air. Easier said than done. My guide and I ran with all our might, but with a huge parachute battling the wind, and being completely strapped to someone else, I fell flat on my face. The second time is a charm and after the first mishap we were up, up, and away! We never travel without our GoPro! The number of restaurants with a view in Ohrid are endless. Every night we had an incredibly tough time deciding where to go to grab a beer, coffee, or food. The good news is that Macedonia and Ohrid are incredibly affordable and we were able to eat very well for under €7. Here were a couple of our favorite spots to eat in Ohrid. Dr. Falafel: We ate at Dr. Falafel a couple times because they had the perfect cost to health food ratio! For less than €3 we got a plate of tasty hummus, vegetables, and falafel. Potpes: We found Potpes to be incredibly relaxing and had an amazing patio overlooking the lake. Don’t miss the mussels here! NOA: Great seafood and even pizza at NOA. However, the best part was the view of Lake Ohrid! The most popular form of accommodation in Ohrid would definitely be private guesthouses. Whether booking on Airbnb, Hotels Combined or find one of the many apartments from a local upon arrival – the options are endless. We stayed at this Airbnb, which had a great location close to the city center, a fully equipped kitchen, and a comfortable bed! We definitely weren’t leaving without doing a handstand! Bus ticket from Skopje to Ohrid: Tickets can be purchased without notice at Skopje’s main bus station. The mini bus ride is comfortable and a beautiful ride and takes about 3.5 hours. Drive from Skopje to Ohrid: If you have a car 3 hours by car then driving from Skopje to Ohrid is ideal. It’s 180-200km through mountainous roads. Fly Skopje to Ohrid: There is a small airport in Ohrid connecting the city to Skopje and many other European cities. We were working our way down to Albania and found little to no information on how to travel from Ohrid to Tirana. Locals didn’t know, our Albanian host didn’t know, even the tourist information didn’t know the correct bus timetables. Like I mentioned before, travel in the Balkans isn’t exactly like it is in Western Europe. We pieced what little information we could find off dozens of websites and made the journey to Tirana from Ohrid. Thankfully we were pretty successful! To get to Tirana from Ohrid by bus we first had to get to the main bus terminal in Struga. Struga is a neighboring town that takes about 15-20 minutes to get to by bus (40 MKD). We walked to the Old Bazaar in Ohrid, crossed the street and went to the only bus stop we could see. We were short on time and there was no bus in sight, so we hopped into an old car that claimed to be a cab. The “cab” cost us 250 MKD (€4) and took less than 10 minutes to get to the Struga bus stop. We found that there were two buses running to Tirana in April, at 9am and 12:30 pm, tickets were €8. Five hours later we were in Albania! Mission accomplished. Accommodation in Balkans: We like to use Hotelscombined to compare various booking engines and make sure we are getting the best possible deal. To feel more at home in the Balkans we use Airbnb. Here is a coupon for your first stay! Here are the most popular cities in the Balkans: Ljubljana, Belgrade, Split, Ohrid, and Kotor. Car Rental in the Balkans: Auto Europe is a car rental booking service that compares all the major brands like Hertz, Avis, Alamo, and Europcar. Water: We found the water in the Balkans fine to drink, if you want extra assurance then we love traveling with our Lifestraw Go Waterbottle. Guide Book: Sometimes it’s just nice to have a real book. We like Lonely Planet. I had never heard of Ohrid before traveling the Balkans, but the Church of St. John at Kaneo and everything else proved to be incredibly beautiful.